Honeysuckle is a vine that grows widely throughout the United States, from California to New England. 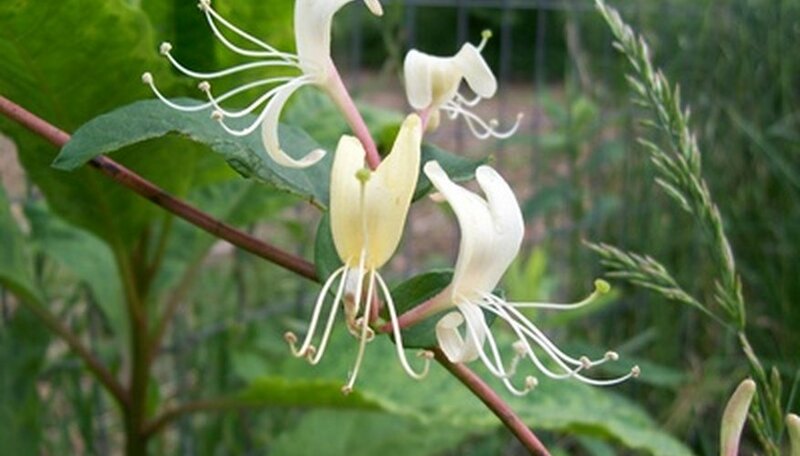 Formally known as Japanese honeysuckle or Lonicera japonica Thunb, its fragrant flowers are the source of the heavenly scent used in potpourris and perfumes as well as teas and syrups. Extracting the delicate essence of the flower is a challenge that most people will not tackle, but it can be done. Spread your choice of fat on the glass tray--it can be refined coconut oil or duck, pig or cow fat, as long as it is clean and odorless. It should be about a quarter-inch thick and be semi-solid at room temperature. This is a very old method, called enfleurage, of protecting the delicate fragrance from flowers, and is still in use today for expensive floral perfumes. Press a layer of the honeysuckle blossoms on the layer of fat and allow them to sit for three days. The fat will slowly dissolve the essential oil from the plant matter so you will be able to smell the fragrance in the fat. Lift off the petals and apply another layer of fresh blossoms. Repeat this process until the fat is very fragrant. Scrape the fat from the glass tray and place it into a large glass jar; add an equal amount of alcohol (such as vodka or grain alcohol). Shake the mixture several times a day for about a week. This will dissolve the essential oils into the alcohol, but not the fat. Pour off the alcohol into another glass container and place it in a freezer for 24 hours. Filter the alcohol again through a wire mesh sieve and pour it into a glass jar without a cover so the alcohol can evaporate. After the alcohol is removed, you are left with the absolute, or the extract, of honeysuckle.